etc.. East Anglia have several refurbished multifunction printers available. Only £595 +VAT call now for availability. This productive and efficient A4 multifunctional colour printer perfectly complements communication anywhere. This astonishing device is suitable for any environment and can sit seamlessly in any location with its compact size and ease of use. The central communication system can be used for small businesses, branch offices, shops and similar environments. It is flawlessly equipped for small team’s everyday communication needs with fast 30ppm in colour and b/w as well as standard duplexing. Speed for A4 colour 30ppm and 30ppm for black and white. Paper formats include A6-A4 and custom formats. 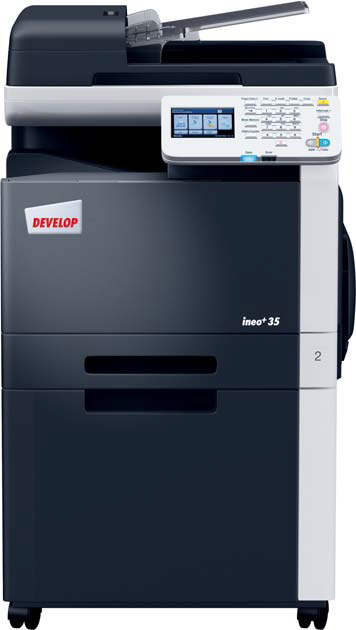 Adaptable colour and black and white printing, copying and scanning. Small, compact and light-weight in design. Ideal to work side by side for immediate access. Versatility and compatibility with most office applications. The multifunction printer’s copying, printing and scanning functionalities are enhanced with colour – providing users with straightforward and convenient printing and copying functionality for internal and external communication, reports, presentations and more. With a generous paper capacity of up to 1,350 sheets, the multifunctional device is equipped to handle all everyday printing and copying jobs with ease and flexibility.